Hello, everyone and welcome! 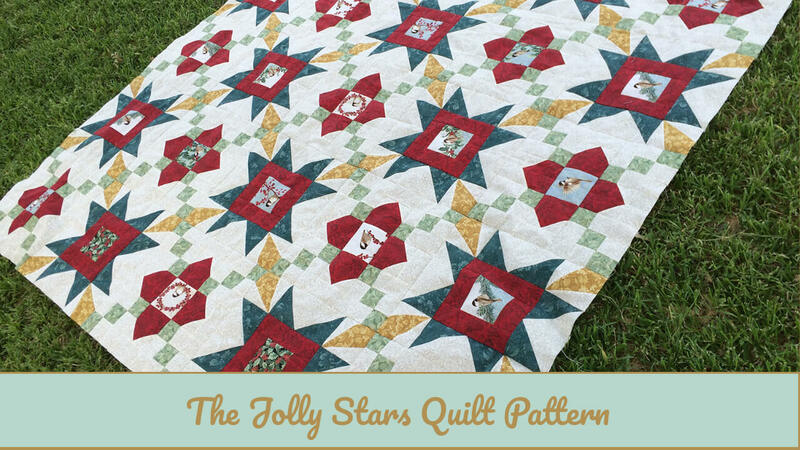 Today I’m excited to reveal my latest design that I call the Jolly Stars Quilt Pattern. In another post, I will explain why I’m so behind and share some of my sketches for future projects. But for this post, I’ll just focus on the positive: a project is FINISHED (well, nearly.) But I’m really excited to share with you a little about the process. This project actually started a few months ago as I was cleaning out my stash. 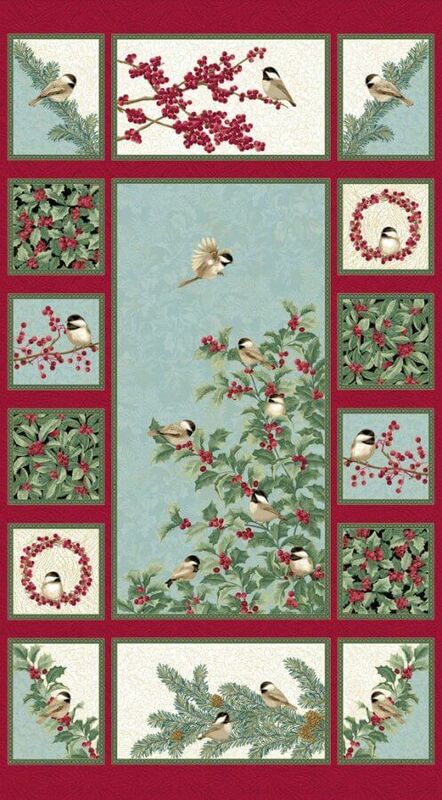 Stuffed in the back were two Benartex “Chickadees and Berries” panels by Jackie Robinson and some coordinating yardage I had purchased two years ago. 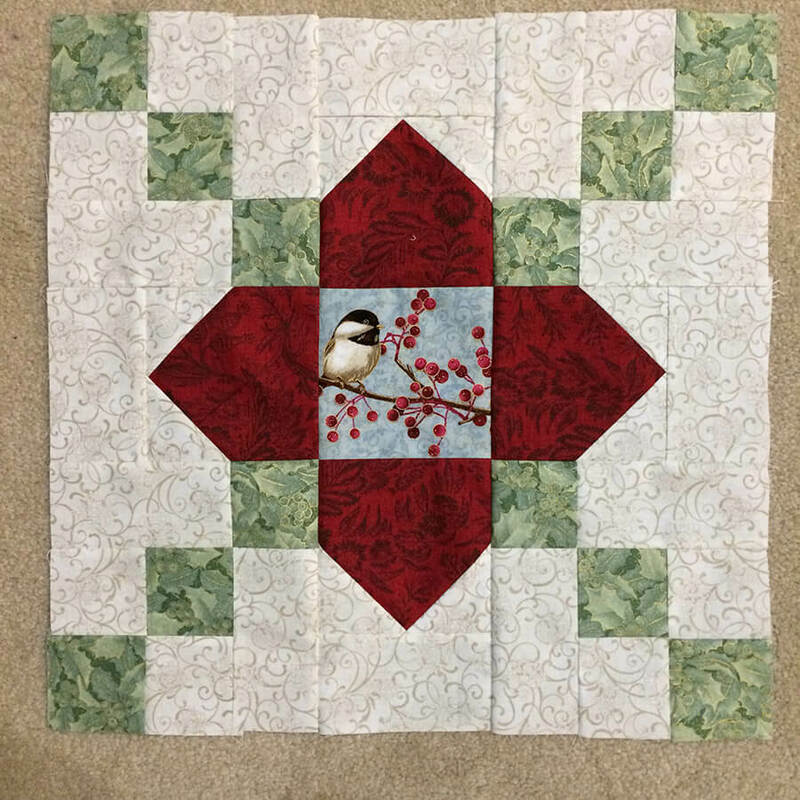 The original intention was to make a quilt out of them for my mother-in-law, as the colors had reminded me of her Christmas style. At the time I bought them, I had thought I would simply put borders around the panels and quilt them. 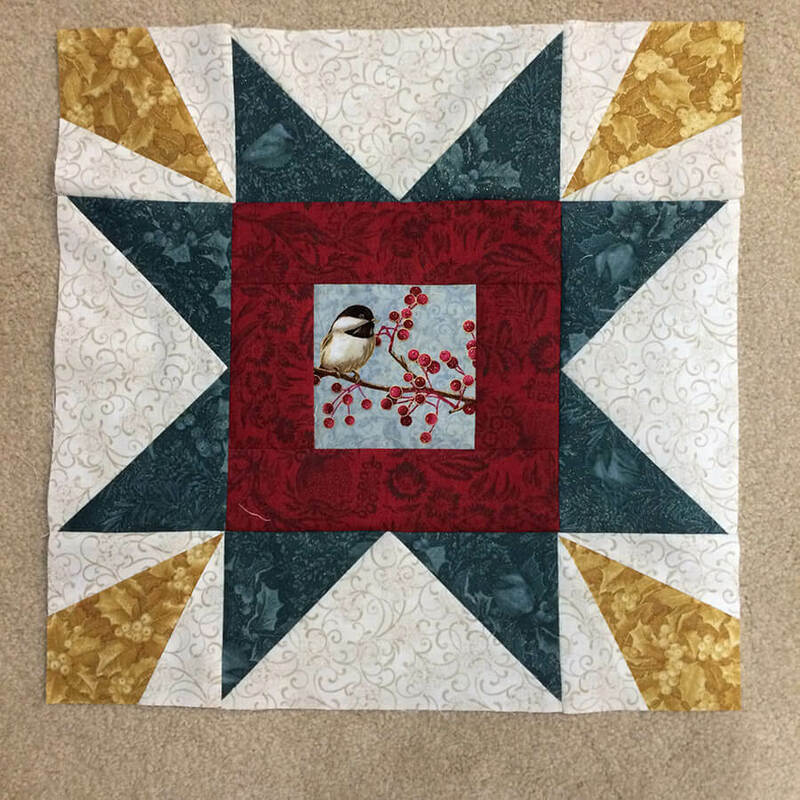 But recently I’ve been into fussy cutting, so I thought it would be fun to come up with a design that fussy-cut the chickadees. Design for me rarely happens in a vacuum. I usually start with some type of inspiration. I decided to Google the designer and the panel, which led me to discover an older pattern that Jackie Robinson had designed for a previous line of her fabrics. 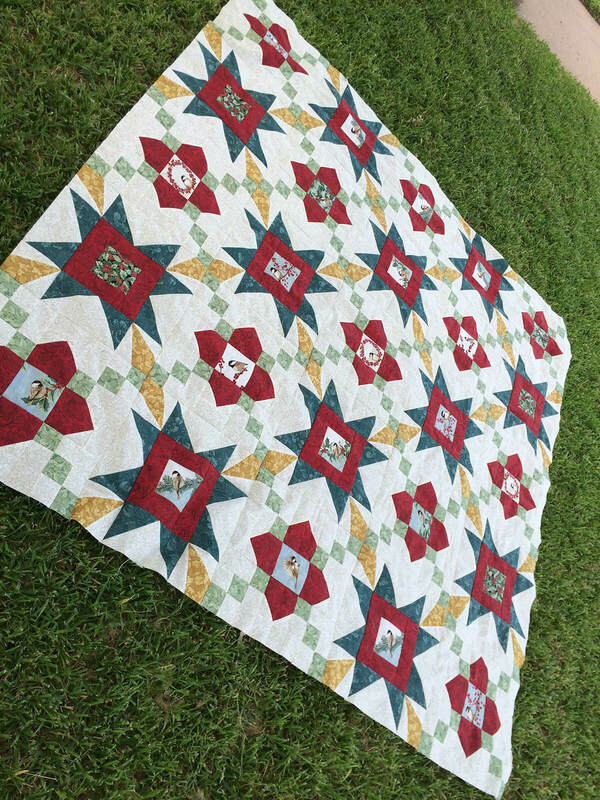 I immediately fell in love with the idea of the quilt having a “chain” effect. 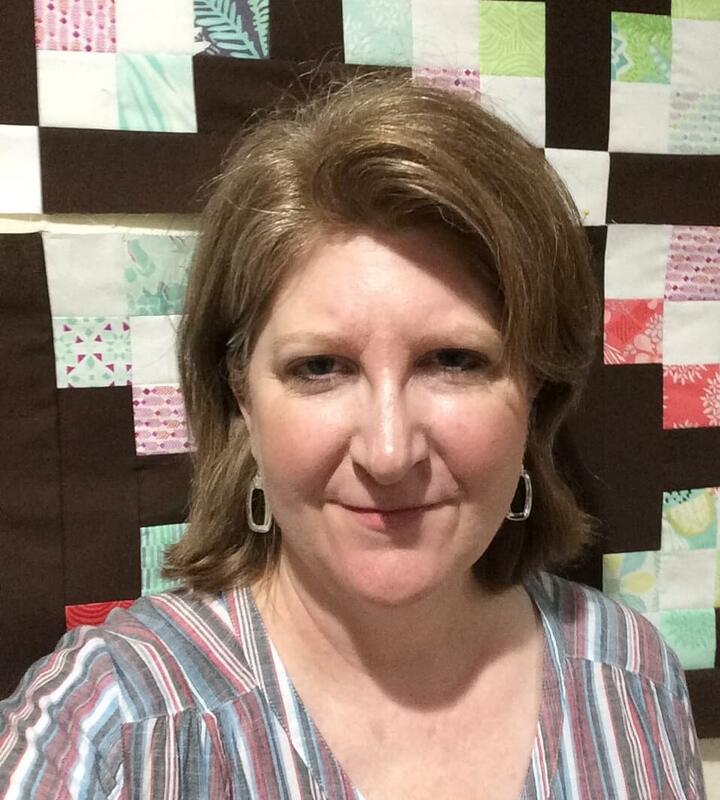 Earlier this year I finished a chain-type quilt and had really loved the process. So I was inspired to incorporate some type of chain into the design. 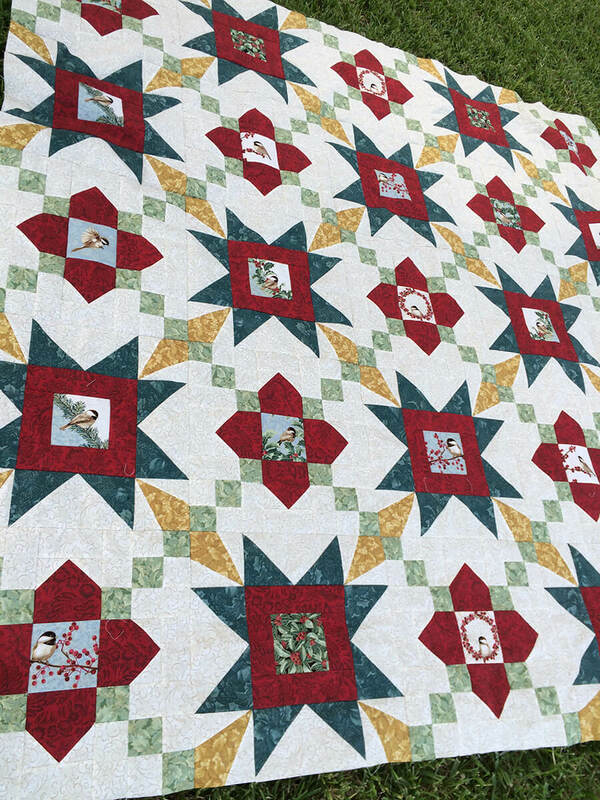 Note that the “inspiration quilt” also uses fussy cutting. But I wanted all my center fussy cut blocks to be 4″ as opposed to having different sized center blocks. Another design idea popped into my head, probably because I’ve been playing with Deb Tucker’s Corner Beam and V-block rulers over the past few months. 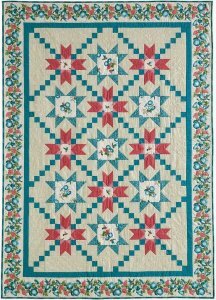 I really wanted to use them in the design, mainly because I think these units are rather uncommon in quilts, and I felt that using them in my design would give the quilt a fresh look. 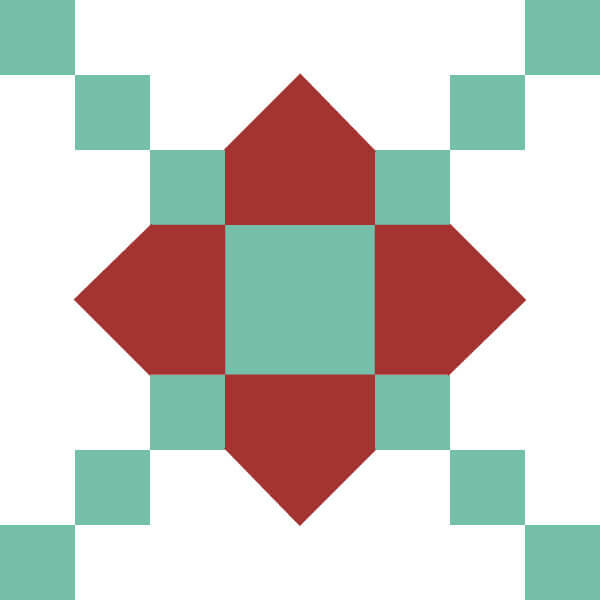 So, I sat down at my computer and started drawing some blocks in Adobe Illustrator that incorporated a chain, V-blocks, and Corner Beam blocks. And of course, the main requirement was those fussy cut 4″ blocks for the chickadees in the panel. As I started to tinker with the design, I realized that I also wanted something that would go together pretty quickly. I decided to make each block oversized. 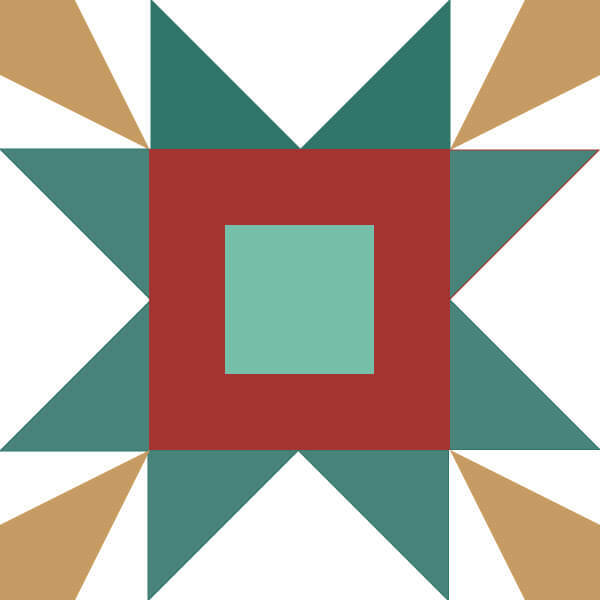 (No 6″ or 8″ blocks in this pattern!) Here are the two blocks I settled on. 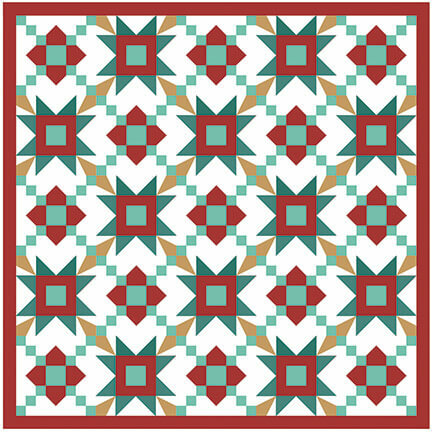 Here is my original sketch of how the Jolly Stars Quilt Pattern would look using the two blocks. I loved how the corner beam units created a mini starburst at each corner when the two blocks met. I started calling that little intersection my “Jolly Stars” and the name just stuck in my head. After calculating the yardage requirements I realized I was a bit short on fabric. Thank goodness for Etsy, where you can often find older fabric lines! I think I purchased every last bit of the fabric I could find there. But I had to abandon my original plan to use light blue for the chain nine-patch units. Instead, I opted to go with a pale green. As fate would have it I stumbled upon some of the blue yesterday as I was looking for backing fabrics. I’m still a little disappointed that I couldn’t make the blue work but that should teach me to not wait so long to use up my stash!!! After calculating the fabrics requirements, ordering fabric and writing out the pattern, I set to work making a few test blocks. 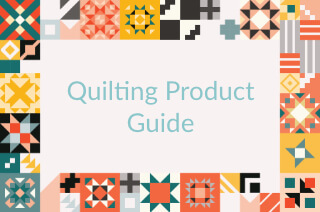 I think that one of the strengths of this pattern design is that it looks great whether you fussy cut the center squares or not, but I think it’s a great tool to have in your arsenal for some time when you want to fussy cut a design. I haven’t had time to sew the borders on yet, but here are some shots of the top I made for the prototype. If you’d like to check out the pattern, you can find it here in my shop.